I bought these sprinkles awhile back for some project or another. But they have been sitting right at the front of the shelf, like they constantly think they are the exact thing I opened the cupboard for. Well, it was finally their lucky day. 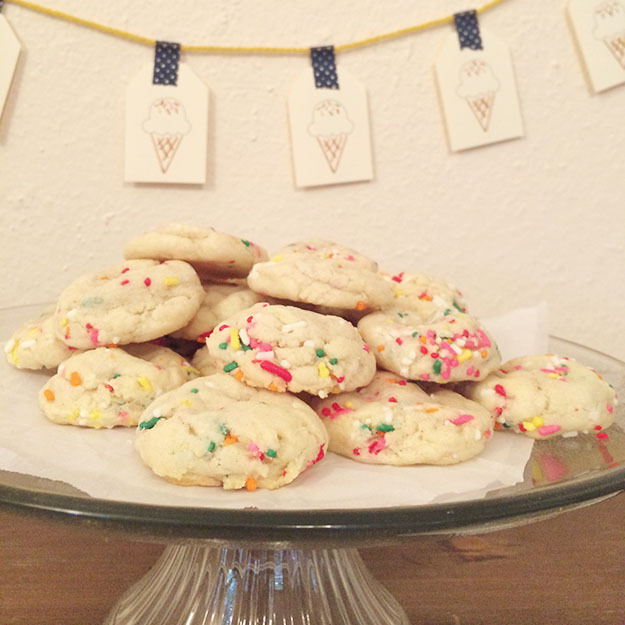 I used this recipe to make some sprinkle cookies. 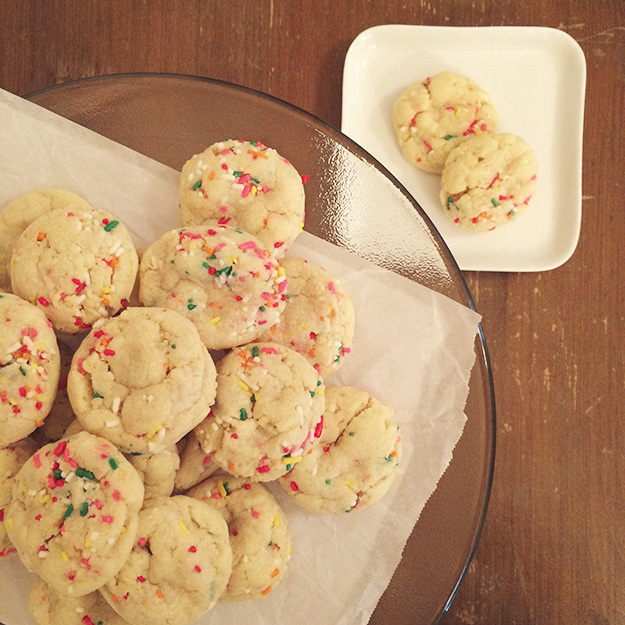 (Mine don’t look like the recipe for some reason…I checked the measurements twice. Hmmm.) They are festive, pure sugar, and ready to party. Cute ice cream cone banner, huh? 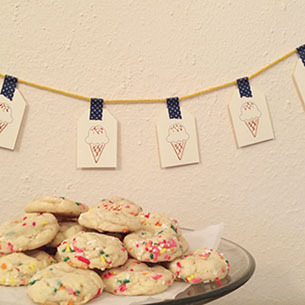 Ice cream cone gift tags with super cute sprinkles are now in the shop! Ready for birthday presents, celebration garlands, or anything else that needs some fun sprinkle action. 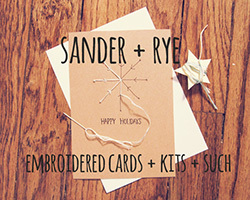 This entry was posted in Eat, Shop and tagged bake, cookies, embroidery, etsy, garland, gift tag, ice cream, ice cream cone, kit, sander and rye, sprinkles on June 12, 2014 by Chelsea. My mom, sister, and I made these for a little crafting experiment. I like the idea of a little fabric or paper banner for the wedding, so we tried out a couple tutorials we found to see what we could make. We used this tutorial for the little tissue tassels, and this tutorial for the big pom pom. I have seen some more tutorials since for the tissue tassels that might be a little better, and I have pinned them here. I really enjoy the making and creating of things (obviously), so I am looking forward to more wedding projects to see what I like best! 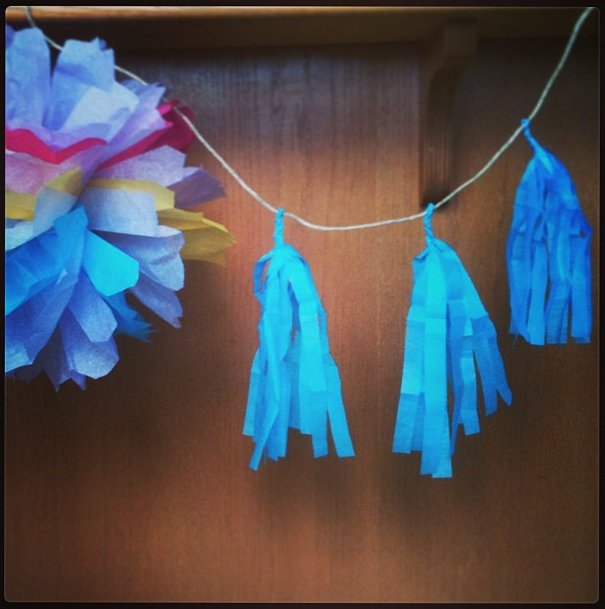 This entry was posted in Life, Make and tagged banner, craft, decorations, diy, garland, our wedding, paper banner, pom pom, tassel, tissue paper, wedding on December 30, 2012 by Chelsea. 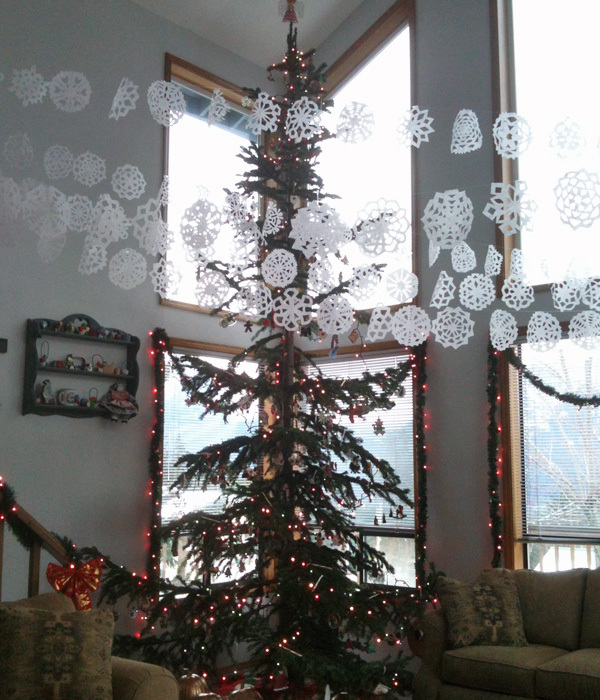 This entry was posted in Life, Make and tagged Christmas, christmas tree, diy, garland, holiday, snow, snowflakes, winter on December 23, 2012 by Chelsea. This entry was posted in Finds and tagged Christmas, decoration, fireplace, garland, holiday, home, mantle, stocking, winter on December 4, 2012 by Chelsea. I love the idea of this paper doll clothes garland. Really, anything paper doll related has a special place in my heart. These would be super cute at a little girl birthday party…someday. 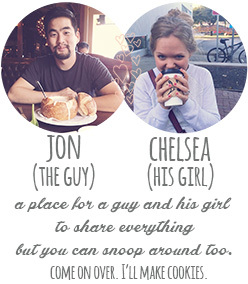 This entry was posted in Finds and tagged bunting, clothes, decoration, garland, paper doll, party on October 23, 2012 by Chelsea.